Guest baths can be tricky. 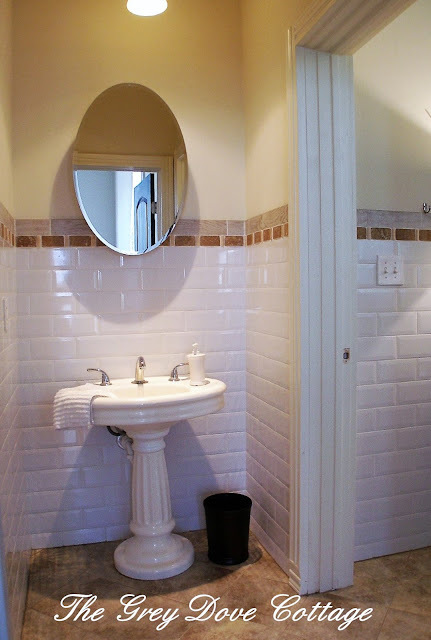 Hosting guest, you hope they'll feel comfortable, and have readily on hand items they may need. There's nothing worse than finding yourself in a guest bath awkward situation, resorting to rummaging through cupboards searching for necessities. 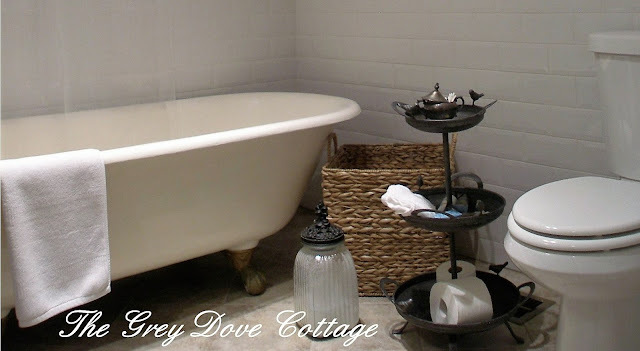 Our guest bath features the original claw foot tub and pedestal sink. 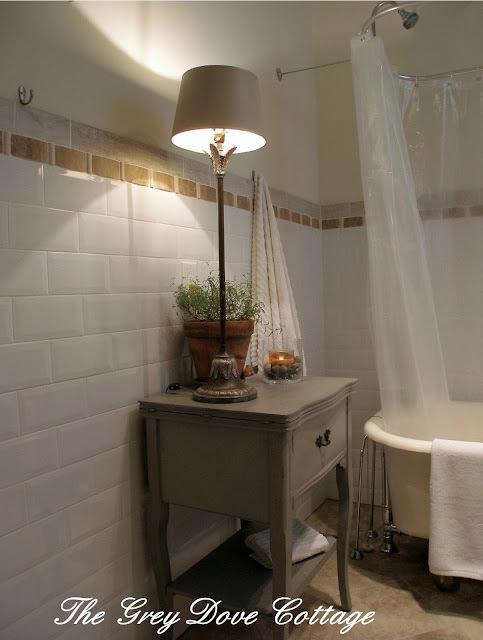 The space is new, an addition by the previous owner, who chose to reuse the original plumbing fixtures. The antique fixtures provide history to the space. To repeat a feeling of history, an antique lace table cloth is used to drape over the window blind. The cloth adds a little romance. 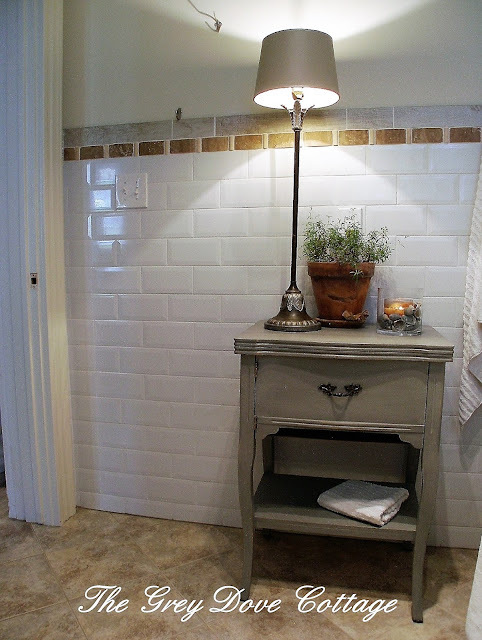 Walls are clad with dove grey subway tiles edged in tumbled travertine, floors are ceramic tile. In our pasts lives, we haven't had a great deal of guests. After moving to the Texas Coast, where the Galveston Port is home to several major cruise lines, we've enjoyed guests. Hosting guest, we want them to be as comfortable as possible. 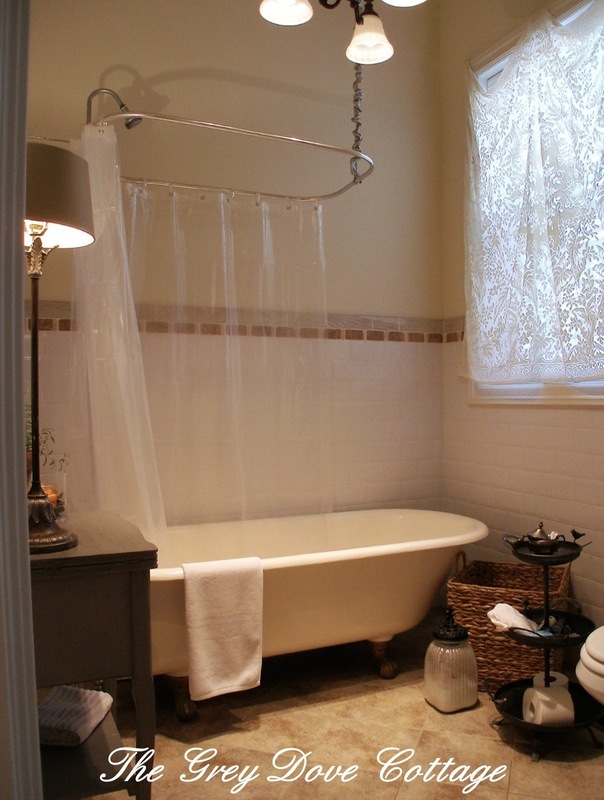 A large sea grass basket holds towels next to the tub, providing guest with easy access. I happened upon a three tier metal piece, adorned with a birds. This type tiered piece is often used for fruit display, serving, or perhaps or a table centerpiece. 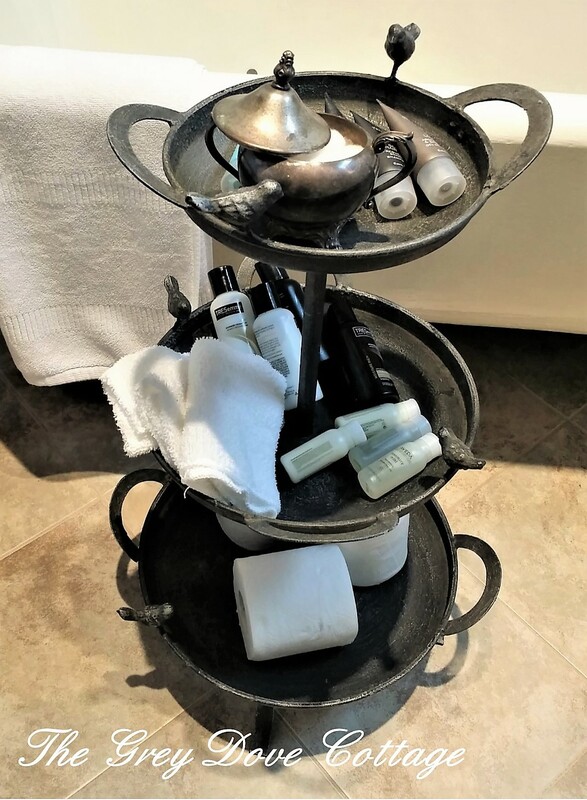 I chose to utilize the piece as display and offerings of toiletries for guest. Upon the three tiered piece are; shampoos, conditioners, shower and soap gels, cotton balls, cloths, and tissue rolls. 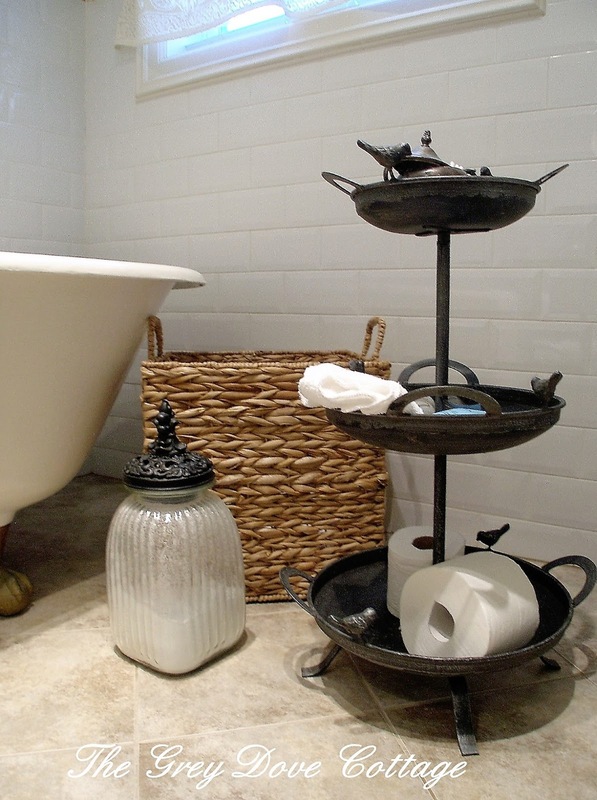 Guest may easily find necessities, and feel free to enjoy them. Storage at Sybi is very, very, (Did I say very? ), very limited. My Grandmother's sewing cabinet offers storage for guest to organize their belongings. Mr. GDC added a shelf inside where additional toiletries may be found for guest use; toothpaste and toothbrushes. The height of the cabinet offers a surface just below a plug for their convenience. The narrow cabinet allows storage without taking up too much space in the bathroom. Refinishing the cabinet in chalk paint, then sealed to protect, the sewing cabinet works well. It seems I forget something every trip, no matter how hard I try! 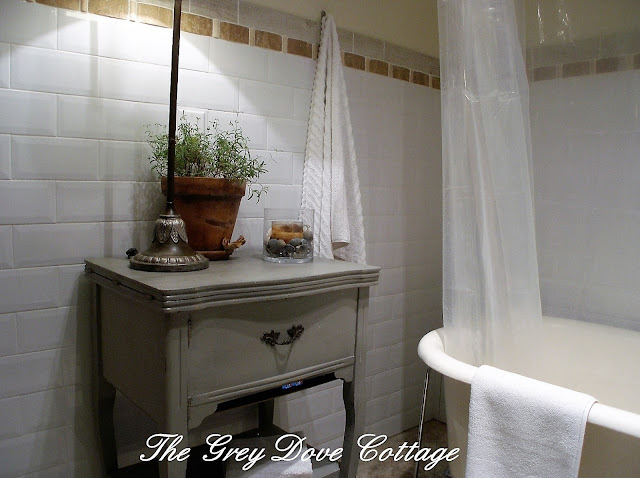 A candle, and pot of fresh rosemary offer aroma therapy. The candle is inserted in a larger cylinder leaving space for a decorative element. 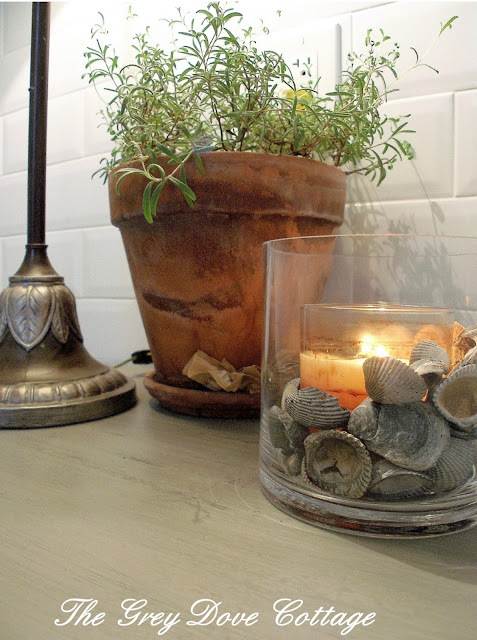 The shells used as decoration were picked up along the beach while upon a walk. Hooks are installed along the wall; two for towels, and one for clothes or a robe. Finally a glass jar fitted with an airtight top offers lavender infused bath salts. The claw foot tub is an amazing soaking tub; deep, and over six feet long, it's generous size offers guests a chance to relax, and soak away the beach. I hope these ideas and repurposing of items help you reimagine your guest bath.